Guegon is our local village a pleasant 5 minute drive through beautiful countryside from our cottage - or cycle through the quiet, but steep, country lanes. Within the village you will find the Bar Tabac Le Saxo, the local Vival general store, garage service-station, florist, hairdresser, and perhaps most importantly a great boulangerie-patisserie for daily fresh bread, croissants and pastries. 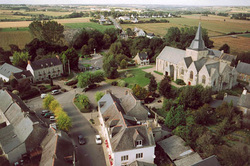 The village also has a doctor, pharmacy, boules court, picnic area, tennis courts and campsite with 18-hole mini-golf course [Camping du Bas de la Lande Apr-Oct]. The Le Drean biscuit factory makes top quality traditional Breton biscuits for the likes of Fauchon, a Parisian gourmet food company, and have some great bargains and gift ideas in their factory shop. There is a historic 12th Century church and the old communal outdoor clothes washing area is still present (lavage). Each year on the eve of Bastille Day, the village holds its own celebrations complete with live music, dancing, barbecue, bar, and fireworks. Visitors are made very welcome and encouraged to join in. The historic village of Guéhenno is noted for its well preserved granite buildings and information plaques are located around a village trail to explain items of interest. You will find several bars, the restaurant La Pomme Dor, a restaurant creperie, boulanger patissier, craft shop, butchers shop, and small general store. The church grounds house an important stone calvary built in 1550. 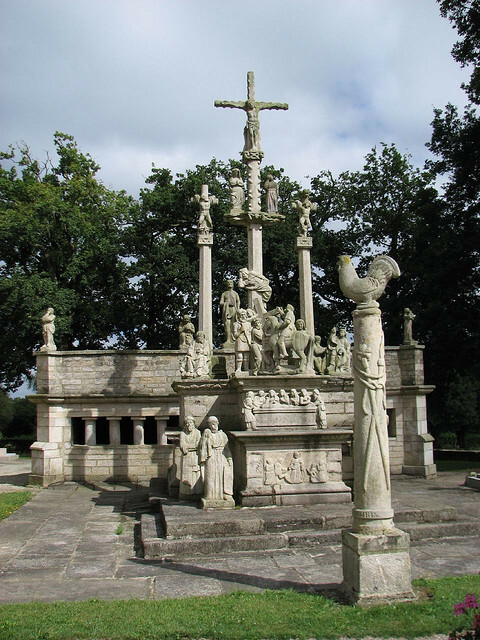 This was damaged in the French Revolution of 1794, when it had to be buried and hidden. 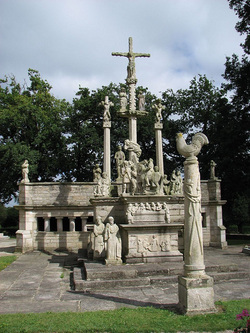 A local Abbott undertook the restoration of the calvary in 1853. There is a picnic area. Travelling to and from Guehenno you may pass the The Manor of Lemay which was constructed in the 16th century and has changed little since. You can cycle to Guéhenno from the cottage using our bikes on quiet local roads and tracks. Lizio - There is plenty to see and do in this beautifully restored village and surrounding area, located just 5 miles away through quiet country lanes. Several signposted foot paths offer delightful rambles in green, hilly countryside. Lizio has been designated a Petite Cité de Caractère (small town of character) in recognition of its 17th Century church and buildings which have been remarkable well preserved. 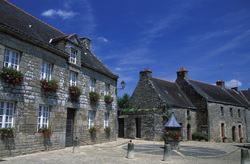 The Ecomusee de la Ferme et des Vieux Metiers is a farming and craft museum. The Poete Ferrailleur is a sculptor/creator/artist who creates machines, toys, musical sculptures and more from waste material. Open daily April to October and open Sundays and holidays, November to March. Other attractions are the Insectarium and two pottery workshops, Poterie Ceramique Alan Guillard and Poerie Creations L'Imaginaise. You will usually find a local artist exhibiting in one of the old shops during the summer. Each summer a major arts & crafts festival takes place in Lizio on the 2nd Sunday in August, the Festival in August 2015 will be the 42nd year. The whole village is shut off to through traffic and becomes the host for a fantastic day of traditional countryside skills, music, dancing, food, plays, arts & crafts. There are 190 exhibitors, displaying everything from scale models to clog making. This is definitely something not to be missed if your stay at the cottage coincides. Every second Sunday in August there is also a smaller local crafts fair. The Centre Equestre de Sainte Catherine (horse riding school) has 30 horses and 15 ponies catering for adults and children over four years with walks per hour & excursions. For the more energetic there are two hiking trails - the botanical path (7.5km/5 mile), the moorland footpath (5km/3 miles) and two mountain bike trails (20 & 35 Km). The walking paths are waymarked and quite easy to follow. There is a map which shows the general routes of the walks and cycle trails. The moorland walk is one of our favourites, and is great combined with lunch at La Liziotaise, the village creperie, or take a picnic to eat on route. There are picnic benches near the ponds and in the village. Plumelec is a small town 10 mins. drive south of the cottage. The municipal swimming pool with water slide is open June to September (various hours, check the link) and is popular with locals and visitors. The central square of the town is dominated by the church. There are a good variety of shops including a couple of restaurants, bars, a boulangerie, takeaway pizza, post office, petrol station, estate agents, butchers and surprisingly large general store. A small collection of sculptures/art works is located just off the main square.